IN his Sunday suit (with ten shillings in his right-hand trouser pocket) and a brand-new bowler hat, the youngest of the Shearnes, Thomas Beauchamp Algernon, was being launched by the combined strength of the family on his public-school career. It was a solemn moment. The landscape was dotted with relatives—here a small sister, awed by the occasion into refraining from insult; there an aunt, vaguely admonitory. “Oh, and work hard!” This by way of an afterthought. Thomas, as he had stated in his letter to his mother, was exceedingly happy at Eckleton, and getting on very nicely indeed. It is true that there had been one or two small unpleasantnesses at first, but those were over now, and he had settled down completely. The little troubles alluded to above had begun on his second day at Blackburn’s. Thomas, as the reader may have gathered from his glimpse of him at the station, was not a difficult youth. He was quite prepared for anything Fate might have up its sleeve for him, and he entered the junior day-room at Blackburn’s ready for emergencies. On the first day nothing happened. One or two people asked him his name, but none inquired what his father was—a question which, he had understood from books of school life, was invariably put to the new boy. He was thus prevented from replying “coolly, with his eyes fixed on his questioner’s: ‘A gentleman. What’s yours?’ ” and this of course, had been a disappointment. But he reconciled himself to it, and on the whole enjoyed his first day at Eckleton. Thomas had inherited from his mother a pleasant, rather meek cast of countenance. 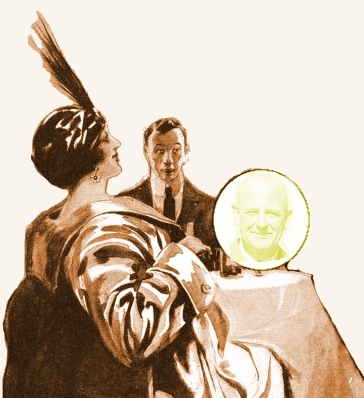 He had pink cheeks and golden hair—almost indecently golden in one who was not a choir-boy. That evening he wrote to his mother and, thanking her for kind inquiries, stated that he was not being bullied. He added, also in answer to inquiries, that he had not been tossed in a blanket, and that—so far—no Hulking Senior had let him down from the dormitory window after midnight by a sheet, in order that he might procure gin from the local public-house. As far as he could gather, the seniors were mostly teetotallers. Yes, he had seen Spencer several times. He did not add that he had seen him from a distance. By the end of the first fortnight of his school career, Thomas Beauchamp Algernon had overcome all the little ruggednesses which relieve the path of the new boy from monotony. He had been taken in by a primeval “sell” which the junior day-room invariably sprang on the new-comer. But as he had sat on the head of the engineer of the same for the space of ten minutes, despite the latter’s complaints of pains and forecasts of what he would do when he got up, the laugh had not been completely against him. He had received the honourable distinction of extra lesson for ragging in French. He had been “touched up” by the prefect of his dormitory for creating a disturbance in the small hours. In fact, he had gone through all the usual preliminaries, and become a full-blown Eckletonian. “What’s wrong with him? Doesn’t look nearly such a goat as you,” said Phipps, with the refreshing directness of youth. “We have some awfully swell friends,” said Thomas. Spencer chewed this thoughtfully awhile. “All right, don’t!” He selected a gelatine and consumed it. “Ever had your head smacked?” he inquired courteously. A slightly strained look came into Thomas’s eyes. He was beginning the fifth length before interruption came. Just as he reached half-way, a reproachful voice at his side said: “Oh, Percy, you’ll tire yourself!” and a hand on the top of his head propelled him firmly towards the bottom. Every schoolboy, as Hon. Macaulay would have put it, knows the sensation of being ducked. It is always unpleasant—sometimes more, sometimes less. The present case belonged to the former class. There was just room inside Spencer for another half-pint of water. He swallowed it. When he came to the surface, he swam to the side without a word and climbed out. It was the last straw. Honour could now be satisfied only with gore. 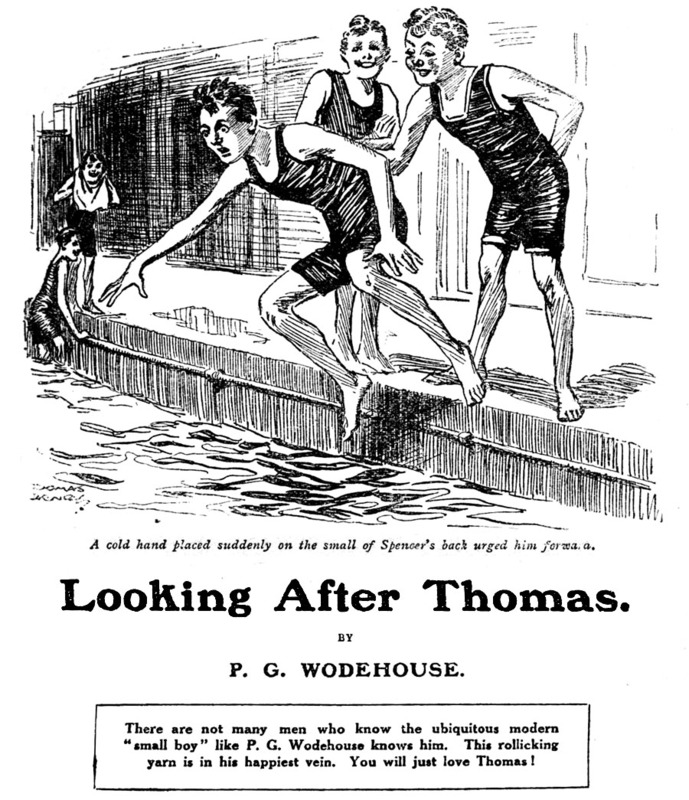 He hung about outside the baths till Phipps and Thomas appeared, then, with a steadfast expression on his face, he walked up to the latter and deliberately kicked him. “I am writing to you direct, instead of through your aunt, because I want to thank you so much for looking after my boy so well. I know what a hard time a new boy has at a public school if he has got nobody to take care of him at first. I heard from Tom this morning. He seems so happy, and so fond of you. He says you are ‘an awfully decent chap’ and ‘the only chap who has stood up to him at all.’ I suppose he means ‘for him.’ I hope you will come and spend part of your holidays with us. As was generally the case after he had had a fair and spirited turn-up with a fellow-human being, Thomas had begun to feel that he loved his late adversary as a brother. A wholesome respect, which had hitherto been wanting, formed part of his opinion of him. It was just here that Spencer regretted that he had sent back that five-shilling postal order. Five good shillings! Simply chucked away! “Messrs. J. K. Shearne (father of T. B. A. Shearne) and P. W. Shearne (brother of same) beg to acknowledge receipt of Mr. C. F. Spencer’s esteemed communication of yesterday’s date, and in reply desire to inform Mr. Spencer of their hearty approval of his attentions to Mr. T. B. A. Shearne’s wind. It is their opinion that the above, a nice boy but inclined to cheek, badly needs treatment on these lines occasionally. They therefore beg to return the postal order, together with another for a like sum, and trust that this act will meet with Mr. Spencer’s approval. “Of course, what’s up really,” said Spencer to himself, after reading this, “is that the whole family’s jolly well cracked.” His eye fell on the postal orders. “Still——!” he said. Thanks are due to Richard Fidczuk of the FictionMags Index team for finding a table-of-contents listing for this story and for communicating it to us via AK; additional thanks to Karen Shotting for retrieving scans of it from the University of North Carolina library. This is a hitherto unknown reprint (with a new title and minor modifications) of “The Guardian” from Windsor Magazine, September 1908. This reprint was discovered and added here in March 2018. See the earlier version for annotations to this story. In the paragraph beginning “The little troubles” this version has “not a difficult youth”; this seems to be a mistranscription of the original story, which has “not a diffident youth.” The original wording seems much more in keeping with the description of T. B. A. Shearne. Thanks to Ian Michaud for proofreading.